Wow, it’s the last day of 2010 already. Where did the year go? I was looking back through my blog posts to put my recap together when it because pretty clear that this year was pretty much about Simon. I’d say probably 85% of my posts were about his latest crisis or an update on his health. The last eight months of his life were an emotional rollercoaster for me. When I left work in the morning, I worried about him all day long. When I’d come home, either from work or being out, I worried that I was going to come home to find him dead. I think that was my biggest fear, coming home (or coming downstairs in the morning) and finding out that he’d died alone. I don’t think I could have ever forgiven myself if that happened. I’ve known people who have simply dropped their pets of at the vet clinic to be euthanized, which I really don’t understand. I realize that there are probably circumstances in which that is the only option for the owner, but it’s something I could never do. Simon’s well-being was my responsibility from the day I got him, and it was my responsibility to see that when it was his time, it was done with compassion and love and no suffering on his part. I made the call to the vet (as incoherent as I probably sounded), I signed the papers, and I was holding him when he died. It was really heartbreaking but I know I made the right decision. Even though it’s been over a month, I am clearly still grieving for him. I think about him every day and he frequently shows up in my dreams - in the strangest places, too. Last night I dreamt I was on a boat, and he was there with me. The night before, I was out hiking with a backpack on, took it off & opened it, and out he popped. One night last week, I was wrapping presents and he kept on trying to eat the red ribbon I was using. It’s a little bit strange, but I guess as long as I don’t start seeing him when I’m awake, I won’t make an appointment with the psychiatrist just yet. Moving right along (*puts box of tissues away*), the rest of my 2010 was spent trying to get my running injury/injuries under control. The custom orthotics, which were supposed to solve all of my problems, actually caused me more issues than they solved. After going back to the podiatrist four (or maybe it was five?) times, he finally decided that he couldn’t help me and sent me to specialized therapy. Thanks, pal. I did see improvement after a month or two of myofascial release therapy, and it was enough to get me back running again. But as is typical of me, I went crazy with the running and started to teeter on re-injuring myself, so I decided to back off and rest for a week or two. Well, that turned into two months and I’m just now starting to get back into the swing of things with a few short runs this week and a training plan which will start in February. 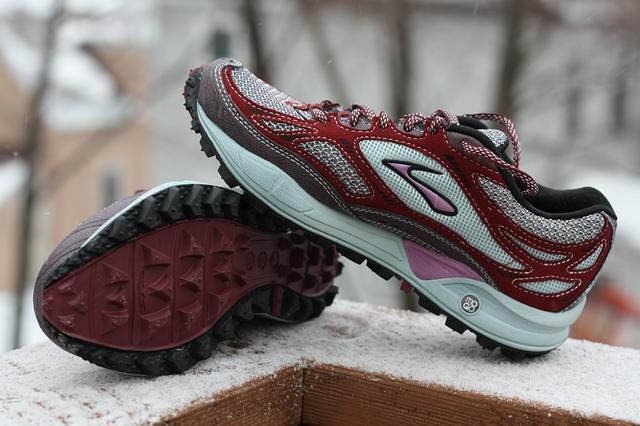 I’ve always done my winter running in my road shoes and YakTrax, but this year I wanted to try shoes that were designed to be in the snow, mud and slop, so I went with bonafide trail shoes. So far, I really like them. They do really well in loose snow both up & down hill. I imagine hard packed snow will be a problem, so I am planning to put screws in the bottom of them for extra traction. Well, enjoy the last day of 2010. See you next year! I like the new format. The medals across the top and the weather stats. The pictures are nice too! Subject categorizing. Good job. Impressive.